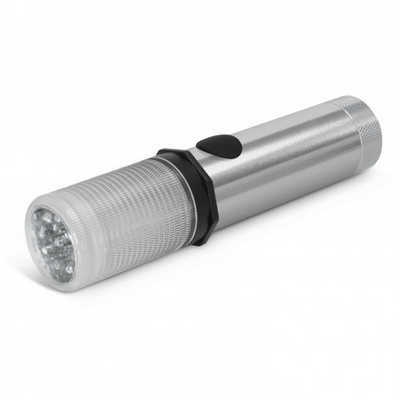 Powerful three function vehicle safety light with a strong magnetic base which allows it to be attached to a vehicle that is parked or immobilised on the side of the road at night. It has a powerful torch with nine LEDs, a red warning light, a red flashing light and it uses three AAA batteries which are included. Colours: Silver. Dimension: W 42mm x H 135mm. Print Description: 50mm x 15mm. Print Type: Pad Print . Packing: Individual box. . Price includes : Printing Per Colour/Position. Setup is included.